Homeopathy. The term is derived from two Greek words meaning "like disease." Homeopathic medicine features prescriptions of remedies for a patient based not only on symptoms but also on individual constitution of the patient. ... then a remedy created by extracting the essence and diluting it, will trigger the immune system to quickly target and cure those symptoms. When my sister, Peggy, visited last weekend, she asked me--while we were viewing an outdoor quilt display!--what homeopathy is. A dozen or more quilts later, I felt I'd done an incomplete job of defining this alternative health therapy. My experience (and the reason Peggy was asking me) dates back several years. I purchased a handbook and starter kit online and began to "take cases" within my family of five. Before I tried my hand at taking cases...which takes at least an hour, if done correctly, sometimes an hour and a half, for me....I had harangued the conventional doctors. I had railed against their quick, cookie-cutter manner of looking for symptoms that match what is "going around" and scrawling out a prescription so you'll be on your way. Having done case-taking the homeopathic way, it became obvious that time is too precious a commodity in conventional medicine. It simply couldn't be done! These herbal remedies are specific to each individual, not merely to the symptoms presented. That's why homeopathy is both alternative and holistic. You'll see in this picture a woman trying to self-prescribe. Warning! This off-the-shelf approach to homeopathy is not what I'm describing, either. Its holistic nature requires taking the entire person into account. Rather, I'm describing the type of homeopathic medicine that entails a visit to a homeopath, giving one's medical history, and the prescription of a remedy, with a follow-up call or visit. Costs of visits vary between $50. to $200., typically. It's less for non-M.D. homeopaths. You may also reasonably expect a lower fee than for a conventional doctor, since there is no lab fee, and the remedies themselves are not expensive. In 1991, the French government did a study on the cost of homeopathic medicine, and found that it costs half as much to treat patients, considering all costs involved. When homeopaths are licensed professionals, most insurance companies will pay for their fees. You would do well to check your own insurance policies to be sure. Insurance usually will not cover homeopathic medicine, because it is sold over-the-counter. Homeopathic remedies work one of two ways: for symptoms directly related to injury or illness, or for constitutional issues. A constitutional issue affects the whole person. That's what truly makes it alternative and holistic medicine. For instance, I go once a year to my homeopath, Louise, for allergies. You guessed it--in the Spring! ...provided I didn't drink coffee. The substance in coffee acts as an antidote to homeopathic remedies, since it also is the root of herbal remedies. For symptoms--like stomach upset, colds, sore throats, headaches--I usually take my own case, or that of my child, and choose a remedy on my own. Curious about what's more serious--a rash or joint pain? sadness or irritability? forgetfulness or paranoia? Homeopathy ranks these symptoms by its "Laws." To get a grasp on them, see Homeopathy Laws! So, you may be wondering, where did this complementary medicine arise? Actually, in Germany late in the 19th century, through the research of one Dr. Samuel Hahnemann (1755-1843). Through what he called 'provings,' he discovered two Laws. This is based on thinking that dates back to Hippocrates in the 4th century B.C. The same thinking provides the basis for vaccinations created by Edward Jenner and Louis Pasteur. Vaccines provoke a reaction in the individual that protects against the actual disease, triggering the immune system in a targeted way. Allergy treatments work the same way. By exposing a person to minute quantities of the allergen, the person's tolerance levels are elevated. The second law Dr. Hahnemann uncovered: "The Law of Infinitesimal Dose" The more diluted a remedy is, the more potent it is. The Law of the Infinitesimal Dose has always caused controversy among those outside the field of homeopathy. Hahnemann contended that as he diluted his remedies with water and alcohol and succussed (or shook) them, the remedies actually worked more effectively. 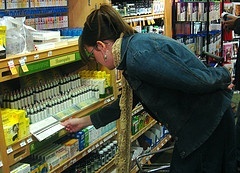 Label-reading tip: Labels on over-the-counter remedies read 30x, 60x or 100x, usually. 30x is the strongest, having only been diluted 30 times. 100x would be the least strong. ..or, what I like to think of as stimulating the body's immune system intelligently to heal the body most efficiently. Anyway, I could list a bunch of names here and not begin to do justice to the wide variety of substances from which remedies are made! So I'll just pick and choose some favorites from my own experience. 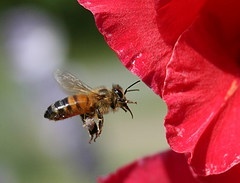 Apis--derived from the honeybee, it is used to treat redness and swelling symptoms. Arsenicum album: a derivative of arsenic, a metallic poison. It works for such symptoms as dehydration, pain described as 'burning,' etc. Bryonia--wild hops: used to treat vomiting, diarrhea, inflammation, etc. Natrum muriaticum (commonly known as salt): used to treat conditions that cause excessive thirst and salt cravings. Ruta: used to treat bruising, such as tennis elbow, sciatica, etc. I hope I haven't overwhelmed you with info! To see many more connections between homeopathic medicines and the conditions they improve, follow this link to Therapy to Benefits. First, choose symptom-related or constitutional care. Visit a homeopath to give your medical history, lifestyle history, emotional temperature, dietary habits, etc. (The details are amazing!) Accept the remedy given and dissolve it according to directions. You'll be joining over 800,000 others who visit homeopaths annually, and similar to the 2.5 million Americans who also used homeopathic remedies. If you're still not over-saturated with information on homeopathy, jump on over to Homeopathy: the Rest of the Story. On that page, I've included the things I had to leave out here! (The difference between symptom and constitutional remedies, "provings," the Rise (and Decline) of Homeopathy, and my own story (with Pulsitilla!). Return from Homeopathy Introduction to Practitioners. Head over to our Healthy-Alternative-Solutions HomePage.